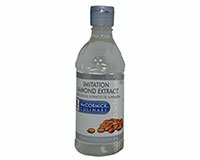 Imitation Almond Extract has a smooth, cherry-like, nutty flavor that enhances a variety of foods and especially good with fruit dishes. Add flavor to cakes, cookies, cobblers, pie fillings, puddings, pastry creams, icings, candy confections, fruit salads, fruit sauces and baked beans. Ingredients: Water, Alcohol (36%) and Benzaldehyde. Cream together 1 cup softened buter, 2/3 cup sugar and 1/4 tsp salt. Add 2/3 cup finely chopped almonds, 1 tbsp milk, 1/2 tsp Imitation Almond Extract, 1 tbsp Chinese Five Spice, and 1 2/3 cups flour. Mix well. Chill dough. Roll into 1/2 inch balls. Place on ungreased cookie sheet. Cover of a glass with a piece of waxed paper and pres each dough ball to 1/4 thickness with the bottom of the glass. Top each cookie with 2 sliced almonds. Bake at 350° F for 12 minutes or until lightly browned. Makes about 4 dozen Chinese Almond Cookies. Combine 2 quarts plain, non-fat yogurt with 1 cup sugar, 4 tsp McCormick Vanilla Extract and 1 tsp McCormick Imitation Almond Extract. Mix well. Serve over fresh fruit. Makes 24 servings (about 1/3 cup each). Add 1/2 tsp Imitation Almond Extract to 1 16oz can cherry pie filling for a delicious cheesecake or ice cream topping.